Since we moved to Copenhagen, we haven’t taken time to go and explore the surroundings yet, and we seriously missed it. So, we packed small bags, put our bikes on the train, and went for a weekend to Roskilde. Small by its size, huge by its history, Roskilde is a town that offers a good mix of outdoor activities, cultural attractions and fine restaurants. We came back boosted with a nice list of good addresses and delightful activities. Roskilde is a town of barely 50 000 inhabitants, located on the bank of the Roskilde Fjord, on the island of Zealand. It is situated less than 30 minutes away from Copenhagen by train, barely more by car. So, it’s possible to go there for a day, but it’s worth spending the whole weekend. Each year, Roskilde attracts a crowd of people to its pop-rock music festival – the most important in Northern Europe. But it also welcomes visitors all year round for its history: Roskilde was Denmark’s former capital city from the 10th to 15th centuries, so obviously it has kept traces from that period. For instance, Roskilde’s majestic cathedral (Domkirke) houses the tombs of Denmark’s kings and queens, and its Viking Ship Museum shows old vessels taken out of the water. And more surprising, Roskilde is a good place for gastronomy as it has a certain concentration of good restaurants that didn’t leave our palates indifferent (so if you don’t care about old stones, go straight to bottom for good addresses ;-). Roskilde is quite calm in winter, but this kind of intimate atmosphere didn’t ruin our pleasure to discover it. It’s a nice town, and it certainly needs to be explored carefully to be truly appreciated. Beyond the main streets and attractions, Roskilde has lots of beautiful and well-restored homes. The surroundings also offer many possibilities to enjoy its lovely nature. Here is a short selection of places we liked. Obviously, we can’t miss its impressive World Heritage Cathedral. It’s actually the first gothic cathedral ever built in Scandinavia, and it houses 39 tombs of Denmark’s kings and queens. So, it’s a long tradition, and we can even see a scale model of the current queen’s, Queen Margrethe II (glurp!). Rather surprising, I must say. 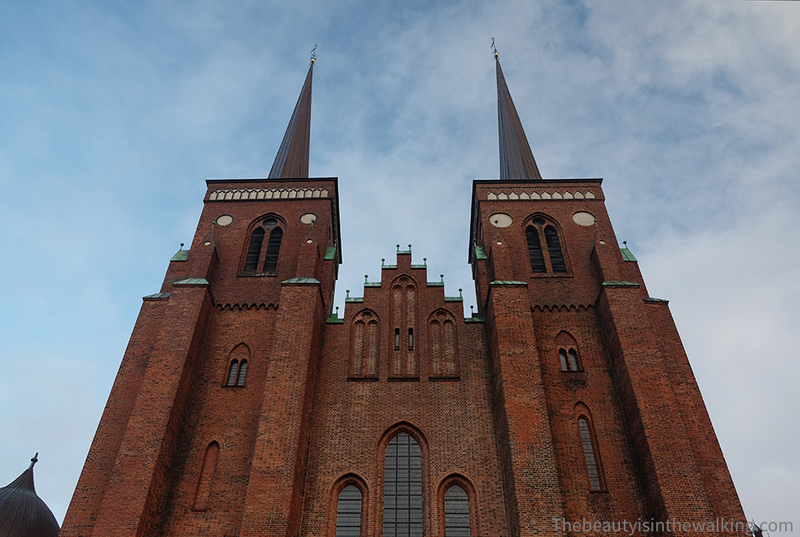 Well, the exact place where this redbrick super-sized building stands has seen no less than 1000 years of churches, and the very first was the one built by Harald Blåtand, in other words Harold Bluetooth. Yep, the same who gave his name to the wireless network (and whose logo is inspired from his initial letters in runic alphabet – the Vikings’ alphabet) and who was known for having unified the different Danish tribes within one single kingdom (as for his name, it seems that he loved eating blueberries, or perhaps was it because he had very bad teeth, History is still discussing the point. Blåtand also was the first Danish Viking king who decided to convert to Christianity, and he wanted to pay tribute to it by building this very first church. This is where we get back to it. Then, over the centuries, constructions followed one another up to the current cathedral, whose lines are inspired from the French style but also very much influenced by the local building traditions and materials. It was completed 100 years after its construction had started in 1170. Inside, it’s like a museum. The visit requires at least two to three hours if you want to see all the chapels, crypts, nooks and nice details. We’ve tried to concentrate as much as possible to find our way among all the kings, queens, wives, children, tombs, and the symbols of the ones and the extravagances of the others. No, it’s not an easy task. However, with a good guidebook, or even the booklet given at the entrance, and being a bit methodical, the visit becomes very interesting. And it’s nice to pay attention to the details here and there; walk up the stairs to figure out how huge the building is; hear the clock ring and watch it get animated every quarter of an hour; go down into the crypts and feel a little shiver; enter inside the chapels; take a close look at the tombs; walk around the choir and the apse by the ambulatory (and complete one’s vocabulary), and judge how audacious the ironwork is, being sometimes circumspect about it. When you finally walk out of the cathedral, take a detour to the city hall (rådhus), and if you’re hungry, book a table at the restaurant in the basement. You’ll see, it’s not a bad idea (see more good spots at the bottom). Located in Roskilde’s harbour, the Viking Ship Museum was built to house five old ships discovered underwater up in the fjord. They had been deliberately sunk to keep the enemy from coming down to Roskilde and protect the town. After a long drying process and wood treatment, the remains of the ships have been gathered and exposed to the visitors in a huge glazed hall facing the sea. The museum, which includes several buildings, tells the story of this fabulous discovery and gives more information about the Vikings’ life. In the main concrete building, where the rests of the old ships are displayed, it’s worth paying for a guided tour. It gives a good highlight of the life in the old times and the history of the different ships. In addition, a video gives explanations about the ships’ discovery and the excavation work: amazing. When we visited the museum, there were also a very nice photo exhibition of the Museum’s photographer Werner Karrasch, showing 25 years of the museum’s activity – the excavation work, the ships’ reconstruction, and the sea sailing – which helps our imagination to give life to the huge wooden frameworks displayed in front of us. The islet by which we enter the museum contains a boatyard where Viking ships have been reconstructed full scale. In this pedagogical open-air workshop, there are wood chips, pieces of trunks, “wet paint” signs, ropes coated with tar, and all that sets the scene. When the good weather comes, the boat reconstructions are launched in the small adjacent harbour, and the visitors can even enjoy a sailing trip inside the fjord. In winter, they are put in dry dock and covered with a tarp in front of the museum (so we couldn’t see so much of them unfortunately). Apart from that, this area also offers craft activities for adults and children during summer, and there’re also a boutique of souvenirs, a Viking café, and a chic restaurant, called Snekken, that we’ve tried and which proposes sophisticated dishes made out of products used by Vikings (more info at the end). Danish harbours in winter have that kind of sad beauty coming out from impressionist paintings. Try to imagine a second the calm water, the seagulls calling, the wind that sometimes strokes and sometimes bites, and frequent showers. And also, that light grey sky, without any nuances as far as the horizon and that light that transforms water into a mirror and makes the wooden poles that separate mooring places dance. They look as if they were floating vertically in the water. The boats look clean, and reading their names is kind of an entertainment for the few brave strollers. Only the most colourful hulls still add a bit of life to the picture. From the harbour, it’s worth walking back a few meters along Havnevej (Harbour lane) and up to the church called Sankt Jørgensbjerg Kirke through the pretty little street called Kirkebakken lined with nice colourful old houses. All around the church, there are also beautiful and well-restored homes, some of them with thatched roof. Then, walk down Kirkegade, turn right on Brøndgade, and then left on the pretty Asylgade and take a look at those funny mirrors fixed on the house windows. They could perhaps be used for watching what was happening outside without having to open the window. Anyway, it’s a very nice area to walk around. Once you’ve passed by all the beautiful old houses, you can get to the town centre by turning left down to Uglebjergsvej and then, using the path starting at the next turn. And take a look at the nice view on the cathedral. As we had brought our bicycles on the train, we went for a ride in the countryside nearby. We had in mind to find Kattinge Village, “one of the most beautiful and best preserved” in Denmark – how could we miss that? As it’s located west from Roskilde, we rode along Boserup Forest and Store Kattinge Sø (The Big Lake of Kattinge), and saw a nice lock, pretty houses and by chance, a flock of geese back from migration in the hilly fields. It takes 30 minutes nonstop by bicycle to reach Kattinge Village. On the way, we have been overtaken by a pack of teen cyclists who were training in tight-fitting shorts and t-shirts in this cold season, whereas we were fighting false flat wrapped in our winter coats (double humiliation). Kattinge Village is not big, but indeed beautiful. It’s composed of a number of pretty colourful old houses with thick thatched roofs. Some of the houses are quite big – certainly former farms – and they have been renovated with taste. On the way back, we decided to teach our urban clean bikes how real life is, and we cut through Boserup Forest (Boserup Skov). I had read that a little café was nested in the middle of the forest, and well it was time for an afternoon snack (what!). And there’s even more. Boserup Forest is a paradise of fauna and flora. It’s not so lively in winter, but in springtime, the fertile soil is covered with flowers, especially Danish anemones of different colours, and there’re also lots of birds living in there. Besides the café, there’s even a nature centre (Boserupgård Naturcenter), which welcomes groups and organises pedagogical activities and workshops for children and adults. It’s possible to explore the forest on foot, go for a romantic cycle ride, or along a mountain bike trail, and you can even camp for the night near the fjord. For us, no café and other botanical or wildlife activities, everything was closed. But we had a nice ride, and we came back home dirty and happy to have had the opportunity to sniff moss and dead leaves. With the app, called Mr Orange, you can create your own guided tours based on your interests. When I tested it, I encountered technical problems but it may work better for you. Roskilde by bicycle: more itineraries here. By train. Several trains go there from Nørreport Station or from the Central station in Copenhagen. It takes 20 to 30 minutes depending on the train and time. You can embark your bike on the train, and remember that you have to pay extra for it. By car. It takes 30 minutes. We stayed at the cosy and affordable Danhostel located on the harbour. It’s a brand new youth hostel (looks more like a hotel BTW), with very good service and nice breakfast as an option. Two steps away from the Viking Ship Museum. Restaurants: Raadhuskælderen (at the city hall basement) offers good bistro food (therefore very meaty) in a long compartmented room, which is nice although noisy when it’s full. The breakfast is worth trying, from what I read. For a muted atmosphere and gastronomic experience, try the Snekken (the worm…), down in the harbour. It’s a classy restaurant, which serves “contemporary Nordic cuisine made of Viking ingredients” (but don’t worry, waiters don’t wear a horned helmet). Good service and good quality. Unfortunately, we weren’t able to try Store Børe next door, whose menu was promising. Have you been to Roskilde? What are the places you enjoyed?